The spacious and elegant Cycladic-style guest rooms are clustered in small groups throughout the gardens. 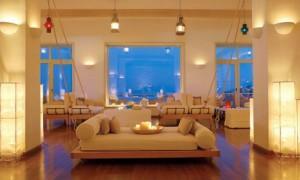 The Aegean decorations are cool and stylish to mirror the island's mystique and the incredible blues of sky and sea. A host of amenities are offered, such as CD/DVD system, LCD flat screen satellite TV, direct-dial phone, Wireless Internet connection, air conditioning and heating, electronic safe, private bar, Treasure Box, hairdryer, shaver outlet, magnifying mirror, bathrobes, beach & pool towels, slippers, and Deluxe toiletries. We would be remiss if we did not mention the hotel's swimming pool collection: One seawater pool on two levels (250 / 40m²), one sharing pool in the Island Bungalow section, six private pools and one indoor pool in the Junior Suites, one sharing pool in the Villa section, and five Villas, each with private pool. The Elixir Fitness Gallery & Spa is as unique as the resort, and as breathtaking as Mykonos. Marble columns with blue veins and walls covered in azure wash combine to recreate the dazzling splendor of Psarou’s underwater grottoes. A menu of massages and special therapies includes everything you need for relaxation and rejuvenation. Mykonos Blu is built above Psarou Bay. This tranquil gulf lies just 4 kms from Mykonos Town.